Full service: These types normally work for one of the more famous investment brokerage companies. Normally they require an investor to open accounts with large initial deposits and most, if not all of the stock trading is done by the broker on behalf of their client. They offer investment advice, tips and reccommendations. In return for this very personal service, the broker will normally charge a large fee and commission structure. Certainly a nice way to trade in the stock market, but not necessarily a very profitable way to trade if you are only a small time stock market investor. Discount brokers: These types came about in the 1970s as a result of the deregulation of the brokers’ fees. Prior to the 1970s, all brokers were required by law to charge their clients the same fees and commission. However, following the deregulation of stock brokers’ fees, discount stock market brokers appeared offering their services for a fraction of the cost originally charged by full service brokers. Online stock brokers: These types are the product of the Internet. In that they came to be and offer their services online. Although they offer limited services as compared to others, they are effectively discount brokers. They can do this because their overheads are lower than all the other types mentioned. Which type of broker should you choose? All things considered. Obviously, the track record of the broker is likely to be the most important element that you wish to consider, but do keep in mind that a broker really is only as good as their last trade or pick, so the other elements of the equation should also be given carefully consideration. 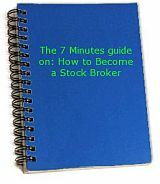 Click here to download the free e-book "The 7 Minutes Guide on: How to Become a Broker".